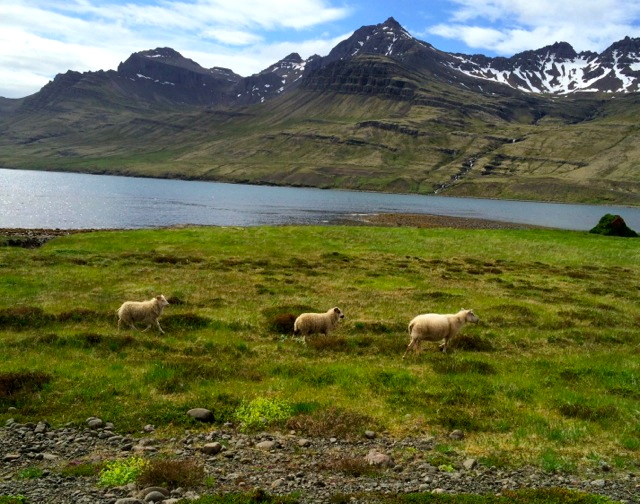 After my trip to Iceland, I fell in love with that country…its gorgeous landscape, its friendly people, its peacefulness and its delicious food and products. One of which is called skyr. Basically skyr means yogurt in Icelandic. It’s a very thick yogurt, thicker than the Greek kind, and has 0% fat. It comes plain, or with various fruit flavors and you can eat it as is or use it in desserts. It’s more packed in protein than its Greek counterpart, and fills you up quite fast, since it’s really thick, similar to a cream cheese thickness. I ate skyr everyday, either in a yogurt form or dessert form. 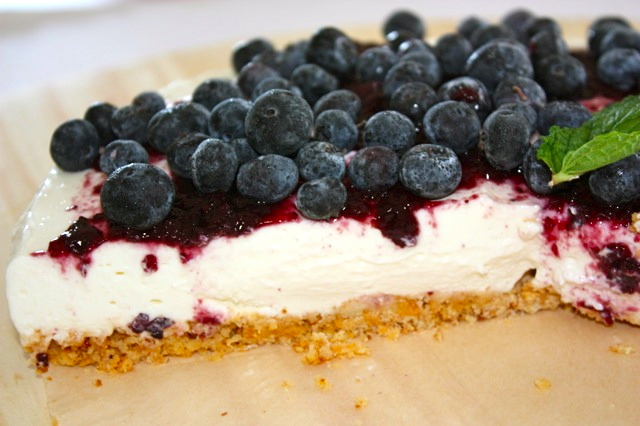 Most of their sky desserts are in this type of form or in a glass with a crust layer, then with skyr, then topped with blueberries or caramel sauce. The good thing is that you can find skyr in the US. 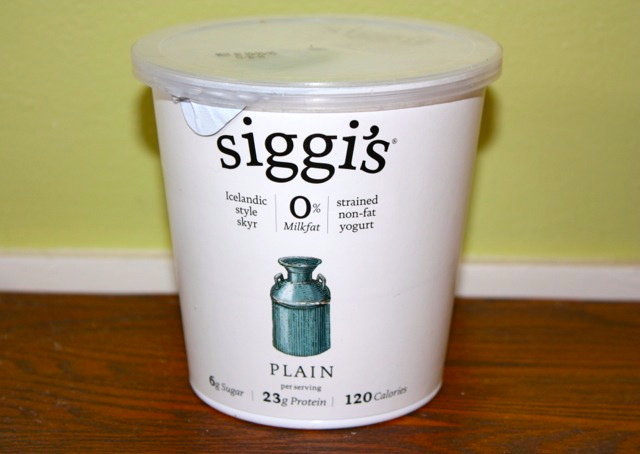 There are basically two brands available here in California, one is called “Siggi’s” and one is called “Smaeri“, both of which are locally made by Icelandic guys who moved to the US, and who apparently imported the real recipe form Iceland. Those yogurts are a bit different from what I tasted in Iceland, and I wish they would import the real ones. I don’t have anything against US made skyr (and I’m thankful I found them even though they’re easy to make), but the taste is slightly different because the cows are obviously different and they are not eating the same type of grass/food than in Iceland; different soil, therefore the milk is different. Anyway, those are just little tiny details, but I think details can make sometimes a difference. Going back to my beloved skyr, in this dessert, there is a slight resemblance to cheesecake in it appearance but that’s it. It has a lot less calories, because skyr low calories due to its nonfat content. Even adding some cream, it will never compare to cheesecake in its texture or taste. I could call this dessert “Skyr Tart” instead of cake. This dessert is now one of my favorites, and will make it regularly. It’s so delicious, creamy, light and delicate, that you would never believe that it’s made with 0% fat yogurt. Crush cookies to a medium coarse texture. Add coconut oil, coconut sugar and mix to obtain a homogenous texture. Using a non stick pan, place some parchment paper (the size of the bottom surface) on pan. Make a crust with the crushed cookies/coconut oil, pressing firmly with your hands and spreading crust on pan. Place pan in the freezer or refrigerator for about 15-20 minutes. In a mixing container, mix both skyr yogurts, add sweetener. Soften gelatin sheets in cold water for 10 minutes or until soft. In a small pot add 3 tbs cream and heat it up. When it’s boiling, remove from heat, add gelatin, stir well and let it dissolve. Add the mixture to the skyr mixture. Whip cream and fold carefully into the skyr. Pour the filling on top of crust and spread it evenly. Refrigerate for about one day. 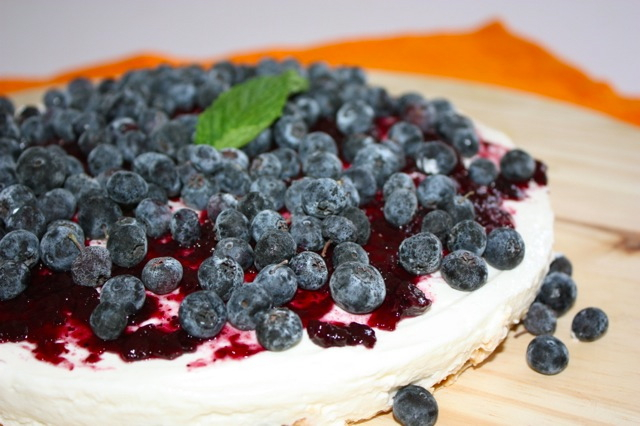 Spread blueberry jam on top and fresh blueberries. 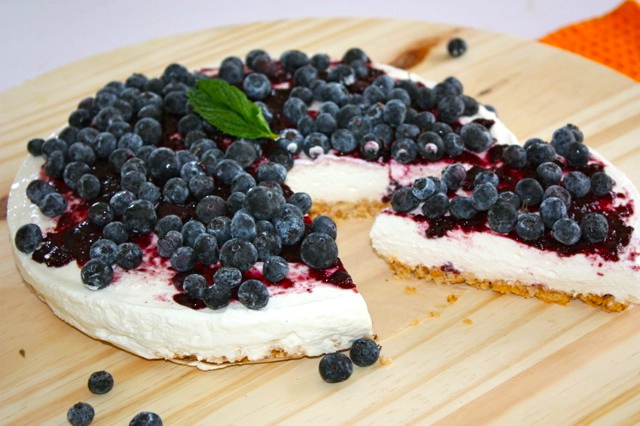 This entry was posted by silvia on August 19, 2015 at 3:06 am, and is filed under Desserts. Follow any responses to this post through RSS 2.0.You can leave a response or trackback from your own site.